عندما تزور داينتري, ستشعر أنك في بيتك في Ferntree Rainforest Lodge الذي يقدم لك إقامة متميزة و خدمات عظيمة. يقع الفندق على بعد من مركز المدينة، ويؤمن الوصول إلى أهم مراكز المدينة. يوفر الفندق بفضل موقعة الجيد وصولاً سهلاً إلى أهم معالم المدينة.
. إن الخدمات الممتازة وحسن الضيافة العالي في Ferntree Rainforest Lodge تجعل إقامتك تجربة لا تنسى. يمكن الاستمتاع بمجموعة من الخدمات على أعلى المستويات في الفندق كمثل تخزين الأمتعة, صف السيارات, غرفة عائلية, مطعم, جولات. يمكن للنزلاء الاختيار من ضمن مجموعة من الغرف المصممة بعناية لتعكس جواً من الراحة، والتي يتجاوز عددها 52. يمكنك طلب اللائحة الكاملة للخدمات في الفندق ومن بينها حمام سباحة خارجي, مسبح (للأطفال), بلياردو, كرة الطاولة, حديقة. مهما كانت دواعي سفرك فإن Ferntree Rainforest Lodge هو خيار ممتاز لإقامتك في داينتري. Seemed The resort is a bit old and tired. However they did a lovely breakfast selection and had a communal kitchen if you were staying a few days it would be handy. Large grounds and looked after very well. Ferntree lodge is soooo beautiful. Quaint little cabins in the Rainforest. Privacy. Relaxed atmosphere. All the amenities you need. Very clean and well kept. Beautiful pools. Free breakfast included. A walk from the beach and local eats. If you are looking for your own little cabin that is a step up from a Hostel but still has the social atmosphere, pick Ferntree. Excellent accomodation. Lovely surrounds in lovey rainforest. Staff very helpfull and friendly. Would definately stay again. I only stayed 2nights but room was large and clean. Food at restaurant was very good and it was only a few minutes from lovely board walks and the beach. Would recommend. Our room stunk. They need to start opening windows. The stairs to the room are rotten and there is no privacy in the upstairs room of the two storey rooms. Dinner was not good and they forgot us. The manager was lovely & we didn't pay for dinner. But this room was nowhere near worth $180. Rustic but clean and functional accomodation in a beautiful setting. Great value for money and lovely staff. Loved our stay and would book again. Enjoyed a three night stay here. Great experience being in amongst the rainforest, lovely restaurant, enjoyed dinner there every night. Close to other attractions around Cape Tribulation, highly recommend. Really lovely accommodation. We stayed in a loft suite that had an upstairs which was ideal for the 3 of us. Rooms had air con and ceiling fans with fridge. Wonderful setting for spotting lots of rainforest wildlife. Staff very helpful and knowledgeable of local area. The dorm was clean and comfortable, and the location, shared facilities and grounds were amazing, although the kitchen could have been kept cleaner. Staff were always available and really helpful too. We had a lovely time at Ferntree. 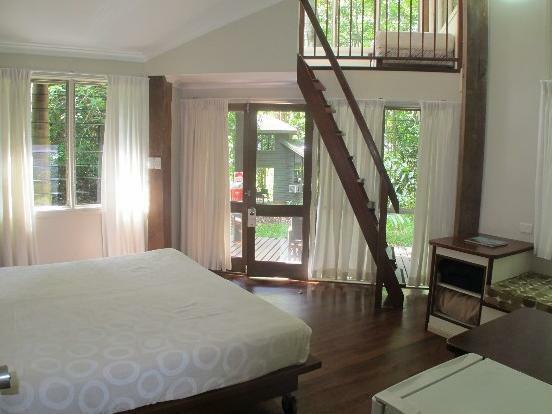 Our bungalow was really cozy in the middle of the green rainforest. We will return. We had a lovely time here. Rooms dated but very functional, surroundings were lovely and well maintained. Breakfast was adequate, dinner was average. 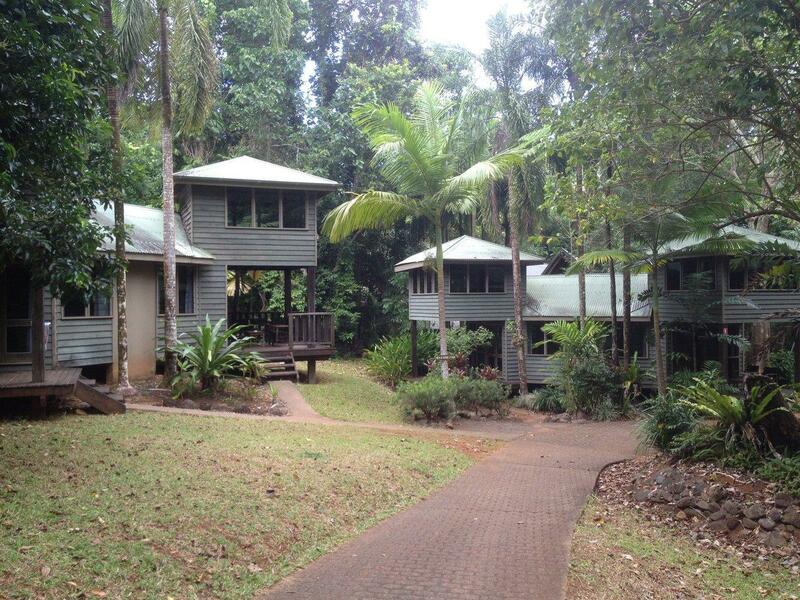 A good place to stay for a few days to see the rainforest. Nice getaway but for the price it is in need of renovation of their bathroom and facilities. Didn't realise they had no TV, wifi or reception so don't book if you value these in your accommodation and get in quick for the limited breakfast! This is a great place. The restaurant is excellent, the man that runs it is a super friendly guy & his food is awesome, thank you for such a great dinner. The swimming pools are nice. The rooms are simple and comfortable, there is air conditioning, a fridge, good water pressure. The place was quiet when I stayed there & suited me. It's close to beautiful beaches, swimming places and easy to find your way around. Would definitely stay here again. great location, need to be more clear on restaurant not being in the same location as hotel, need a change machine or make the pool table for free and hot water does not really work there! But beautiful surroundings, swimming pool and rumpus room! Plus the staff were helpful when I was sick. Neutral. I was beither impressed nor disappointed. Stayed one night only, as planned. Would not visit again Resteraunt not welcoming ... Food was cold ...front of house staff not up to job !! What a great location right in the rainforest and not far from the other restaurants here. Some great walks and lots to do if you like getting back to nature. My wife didn't particularly like the fact that there was only a communal television but other than that thumbs up.